In these darkest days of winter, as we wait for the light to spiral back upwards from its nadir at the Winter Solstice, the garden is largely dormant, and the gardener is glad not to be out in the cold. But this procrastinator admits that this year, the last spring bulbs didn’t get in until the week between Christmas and New Year’s. By sheer luck a day of warmth and thawed earth permitted the digging. Fortunately it was followed by a day of cold rain to soak the bulbs in and keep the squirrels from digging them right back up. That ended the gardening season, except for the tools, of course. That was another day’s chore, ideal for a cold winter’s day, another way to enter the New Year feeling ready. First, I tackled the big tools: a spade, a red-handled gardening fork, a hoe, and a pickax, also known, in a smaller and perhaps more genteel form, as a mattock. But this one is definitely a pickax, a hefty tool, handy for digging up the last patches of sod to make a shade garden a couple of years ago. This year it loosened the leftover roots of an azalea killed by summer’s dry heat. And yes, it was useful when we tackled the excessive spread of some of the cacti in the Waterwise Garden at Simpson Gardens. So there you have it: even older lady gardeners get to wield a pickax once in a while. Here’s how one prepares the tools for winter: First, a bucket of warm soapy water (dishwashing liquid or Lysol cleaner are fine) for washing. Grime accumulates on handles and grips, crusts up blades, and even discolors synthetic materials that have replaced wood handles on most new tools. Rinse, then dry with old terry towels. 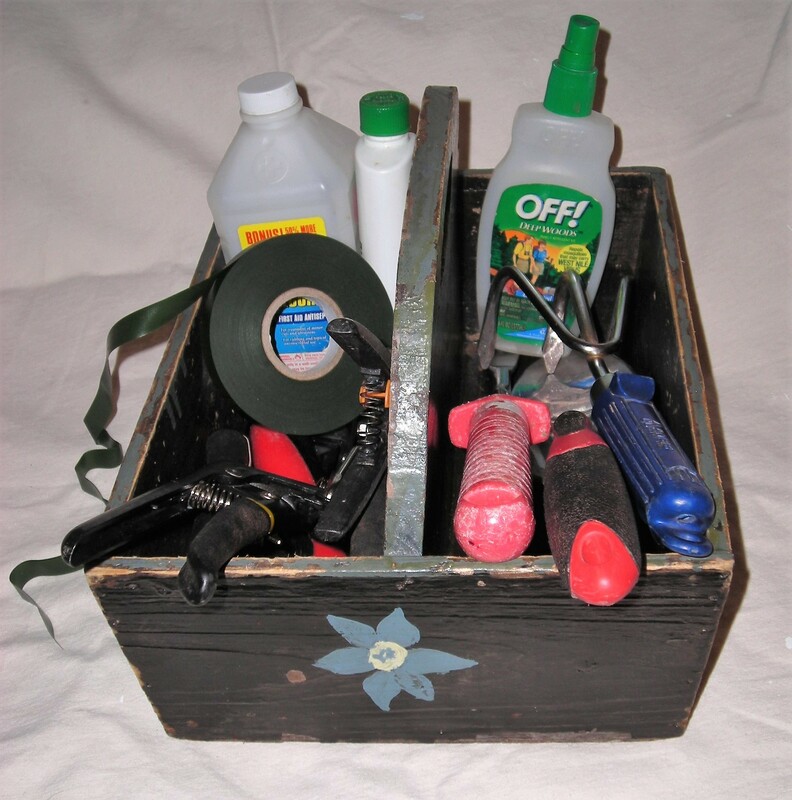 Next, the hand tools: I empty the used wooden trug I bought the year I became a Master Gardener – it was a dingy, well-worn, but sturdy two-section carrier with a comfortable handle. 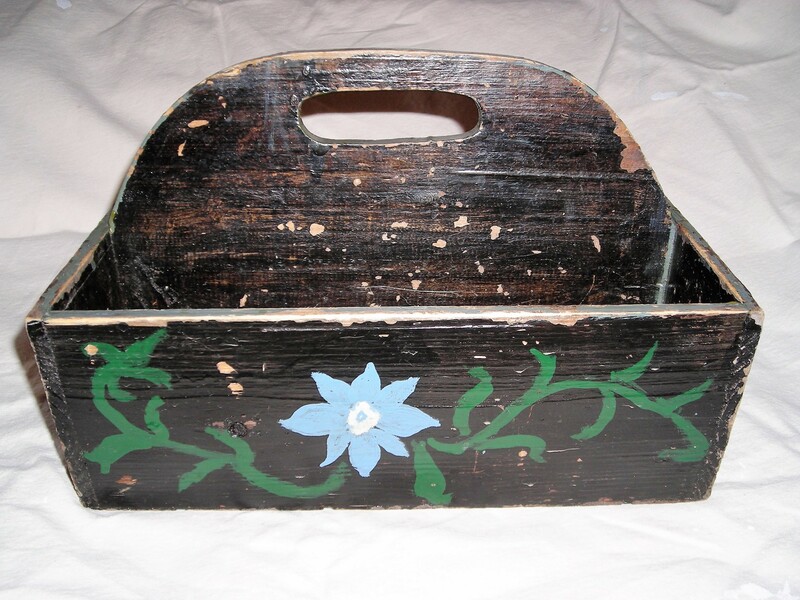 I painted it glossy black, edged the tops of the sides and handle with blue, and decorated it with my initials on one side and a generic blue flower centered in a green arabesque of leaves on the other, and another single blue flower on each end. Mind you, this is not high art. It’s just my way of personalizing a piece of equipment. Over the years, it’s become rather dinged up. The trowels and weeders, the pruners, clippers, and shears have all made their marks, chipping the paint, which is further abraded by the siftings of dirt that sometimes linger on the bottom between cleanings. Out of the trug come the trowel, the little blue-handled hand fork, the dandelion digger that works so well for general weeding, an old paring knife, the folding saw, three sizes of clippers, and a hand-shearing tool for edging. Down from the pegboard comes the big lopper and the kneeler. Trug and tools all get scrubbed, rinsed, and dried. Next I get out the old rasp I inherited from my father and use it to hone the blades of the spade and the trowel, smoothing any rough burrs off the edge of the hoe and the pickax. It hones and smooths clipper and lopper blades as well. The smaller clipper blades may fit through a knife sharpener if you have one. Lastly, a drop of oil for the hinges of all clippers and the folding saw (WD-40 or 3-IN-ONE are both fine). Wipe all the blades with a bit of oil to prevent rust. That’s it! 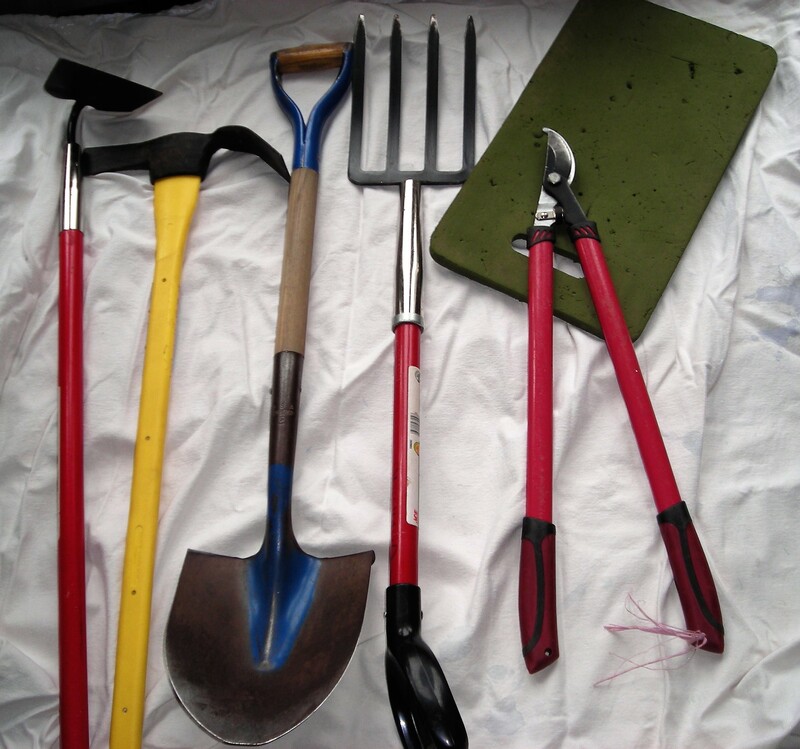 You can store the digging tools until spring, and the cutting tools until later in the winter when it’s time to prune the roses or other shrubs. I arrange the small tools back in their clean trug –cutting tools on one side, digging tools on the other. A bottle of rubbing alcohol keeps blades from spreading diseases, and bottles of insect repellent, sunscreen, and disinfectant (for cuts or splinters) fill the corners. Other useful supplies to tuck in include green soft ties for staking, and a magnifying glass to help identify insects, plant parts, or signs of disease. Good tools are a joy! Now we get to snuggle down for winter, read gardening books and catalogs, and dream about masses of color rising out of that cold dark soil come spring. 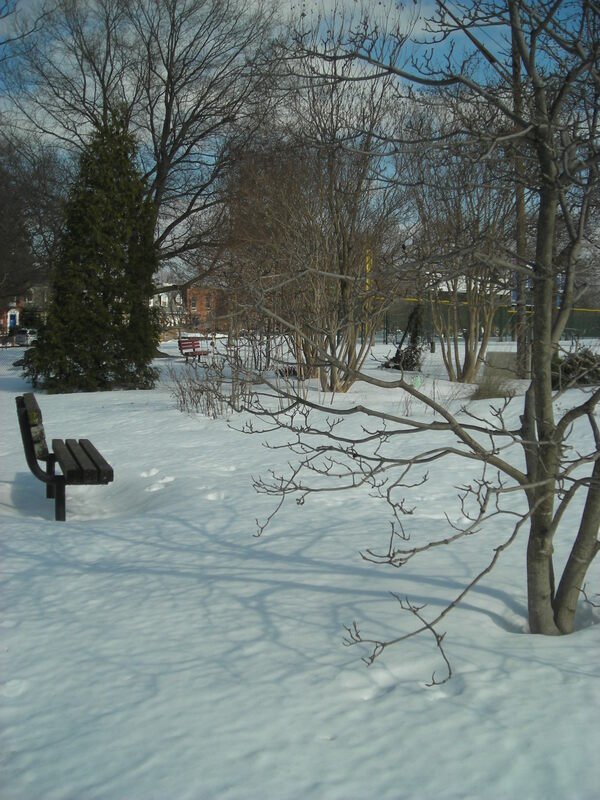 This entry was posted in MG in the Garden, Public Education, Simpson Gardens, The Long View – Meditations on Gardening and tagged Garden tools, Simpson Demonstration Gardens, trug, waterwise garden, winter cleaning. Bookmark the permalink.